On Saturday 26th April 2014, the Dee and Mersey Group is running a railtour to Minehead, in collaboration with Chester Model Railway Club. 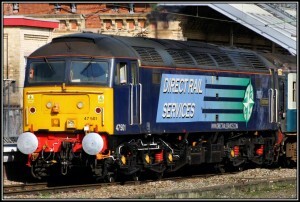 The train, diesel-hauled by a Class 47 locomotive, starts from Hooton picking up at Bache, Wrexham, Gobowen and Shrewsbury. The train then proceeds south along the Marches Line and under the Severn to the drop off passengers at Bristol and then Weston-super-Mare before continuing to Taunton after which the train joins the West Somerset Railway through to Minehead. Those who so wish may then take a journey on one of the WSR’s steam hauled service trains. For full information and online booking see www.chestermodelrailwayclub.com/railtours.htm or telephone Laurence Wheeler (01244 678070) or Jim Parrish (01244 329944). The Group has been organising railtours since 1978 with the proceeds supporting many FR projects, the most recent example being the purchase of the slates for the new Porthmadog Signal Box and Relay Room. This year the whole of the Group’s share of the proceeds is to be given to the Welsh Pony Appeal.